If you ingest a relatively large amount of [read: sufficient] magnesium through regular foods or supplements, your chances of arteriosclerosis are smaller than if you consume less magnesium. American nutrition scientists at the USDA Human Nutrition Research Center on Aging discovered this. In many ways magnesium is similar to calcium. Therefore, if the ratio of calcium to magnesium in the body is disrupted, calcium can displace magnesium in cells and tissues. If there is too much calcium in the blood vessels, they will become stiffer in the short term and the blood pressure will rise. In the longer term such a skewed balance may also accelerate arteriosclerosis, nutritional scientists suspect. Many Europeans and Americans do not consume the recommended amounts of magnesium. The researchers used data of 2695 people, who participated in the Framingham Heart Study. 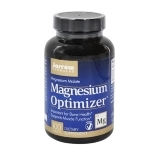 The study participants had told what they ate, so the researchers were able to calculate their intake of magnesium. The researchers had also determined with CT scans whether and how much calcium had deposited in the coronary arteries and the aorta in the abdomen. The more magnesium the study participants consumed via their regular diet or supplements, the smaller their chances of arteriosclerosis. AAC = abdominal aortic calcification; CAC = coronary artery calcification. The relation between magnesium intake and arteriosclerosis was also present if the researchers only looked at the more serious forms of calcium deposits. The researchers were able to calculate that with every 50 milligrams of magnesium that the study participants consumed daily their risk of abdominal aortic calcification decreased by 12 percent, and their chance of coronary artery calcification by 22 percent. "We observed strong, favorable associations between higher self-reported total (dietary and supplemental) magnesium intake and lower calcification of the coronary arteries, an important, discriminating measure of subclinical atherosclerotic burden that has been shown to reclassify risk of cardiovascular disease morbidity and mortality", the researchers summarize. "Our observations suggest that future research may consider magnesium's effect on coronary artery calcification to be a potential physiological mechanism through which dietary magnesium mitigates risk of stroke, nonfatal myocardial infarction, and fatal coronary heart disease." "In addition to further research on magnesium in relation to the number and density of calcified lesions, and calcified and noncalcified plaque burden, prospective research is also required to elucidate magnesium's relationships with these and other sites of vascular calcification, as well as the possible benefits of magnesium supplementation in inhibiting onset and progression of atherosclerosis and calcification, with the goals of identifying magnesium's mechanism of action in lowering the risk of future cardiovascular events, and ultimately lowering the burden of cardiovascular disease." JACC Cardiovasc Imaging. 2014 Jan;7(1):59-69. In older age groups, where cancer and cardiovascular disease are major causes of death, magnesium reduces the mortality risk. Magnesium supplements containing magnesium oxide cost next to nothing at a drugstore, yet they can improve the quality of your sleep - and they don't cause side effects. Trial. Magnesium supplements probably fit perfectly in the life-extensionist's diet. We deduce this from recent epidemiological studies done in Germany and the US.